In 2005, Tony Hsieh decided to relocate the Zappos team to the ultimate service state, Las Vegas. Shortly after the team arrived, they partnered with Adopt a Highway (garbage clean up) and sponsored their first three miles. Fast forward to 2013 and they now sponsor over 158 miles. Although this is far from innovative marketing, it does have some uniqueness. 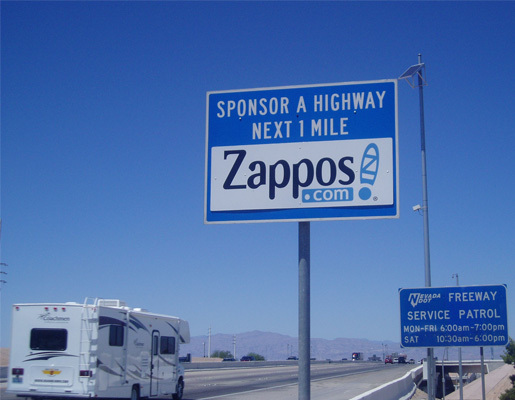 I’m sure thousands of people drive by and ask themselves “what’s a Zappos?” I personally think they should hang a real shoe from each sign. 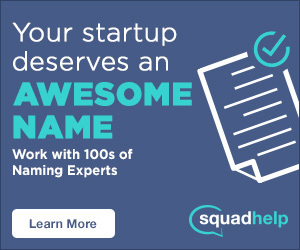 Like Starbucks (who recently started paying for college tuition for their employees), Zappos understands that running a successful company is dependent on their ability to hire and retain great people with creative skills and strong morals. These people place a stronger emphasis on what their employers value – internally and externally. Pay may still be a dominant variable, but it’s no longer the only one. On the other hand, buyers in the marketplace have more choices and build in multiple variables into their purchasing decision. Things like how companies treat their employees, beliefs, values, benefits, mission statements, etc. Easily accessible information via smartphones and connectivity via social networks makes it easy to be aware of what brands are participating in. It’s no longer only about price. Zappos, (subsidiary of Amazon) was founded by Nick Swinmurn in 1999. The company is currently CEO’d by Tony Hsieh and headquartered in Las Vegas, Nevada. Tony and Alfred Lin (partner at Venture Frogs) were initially skeptical of the highway idea. What convinced them? Swinmurn’s sent a voicemail to Hsieh and mentioned that footwear alone in the US is a 40 Billion dollar market and 5% of that was being sold by mail order catalogues. Shortly after their product launch, Swinmurn stepped aside and let Hseih take over. Zappos is often recognized as the online shoe retailer that lets customers ship both ways. This doesn’t seem innovative now (eyeglass frames, clothing, engagement rings etc.) but at the time, it was a new marketing idea that was build into the product. This successfully drove word of mouth and got momentum going. Hsieh attended Havard University and launched his first company at an early age–just 9 years old. The company was simple: buy, collect and grow worms and then sell them. However, the worms kept escaping. Hseih’s young company failed to get momentum and closed their (bedroom) doors after just one month. He started his next venture at 23 years old when he founded an advertising network called LinkExchange, which was later purchased by Microsoft in 1999 for a cool $250 million. One of the reasons Tony wanted to sell the company was because he was unable to maintain a fun and happy work culture. This lesson would play a vital role when developing a oneof-a-kind work culture at Zappos. Why is Zappos called Zappos? The company was initially called shoesite.com, but rebranded shortly after their initial launch. The word Zappos is commonly thought to be derived from the word “zap,” (shipping is so fast, it’s like a zap) however it’s actually a catchy variation of the spanish word for shoes: “Zapatos.” They intentionally didn’t called it “zapatos” because their vision was much larger than just becoming the largest online shoe retailer. Today, Zappos also sells clothing, handbags, watches, eye wear, kids merchandise and much more. Although they have diversified their online store, 80% of their revenue is still driven from shoe sales. Happy Friday Twitter world! Kim in the house for awhile!